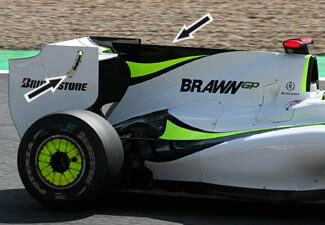 Brawn GP have brought a shark fin engine cover to Spa, resembling much to Renault's version. Jenson Button drove it on Friday for quite a few laps, but the team eventually decided not to race it. We may however see it again on future tracks this year. Another point of interest in this image is the rear wing adjustment possibility. As earlier posted, Williams opted to have the trailing edge lower than the maximum rear wing height. Brawn on the other hand always have the maximum height and adjust the rear wing's angle of attack by moving the leading edge up or down.